People quite often thought Marcus was being funny when he wasn’t. Prevailing Narrative Voice: Close third person alternating by chapter between two main characters. Both characters closely interact with each other presenting different perspectives on one another. When the chapter is from Marcus’ POV the narrator has access to Marcus’ internal perspective. The same is true when the chapter is from Will’s POV. What the reader learns in the first paragraphs: Marcus is an unusual twelve-year-old boy whose mother has just ordered delivery pizza and broken up with her boyfriend. What the reader learns in the first ten pages: It is 1993. After pizza and talk about the ex boyfriend in the first chapter, we meet Will in the second. He is self-defined as “totally cool” and exactly the type of guy that Marcus’ mother would go out with. Where Marcus is unclear of his preadolescent role in the world and with his “mum” and her boyfriend troubles, Will is thirty-something and the counter opposite of Marcus. It is clear these two will cross paths. Basic plot from the book jacket or Wikipedia: The novel is about Will Freeman, a 36-year-old bachelor, and Marcus, an eccentric, introverted, bullied twelve-year-old who lives alone with his suicidal mother, Fiona. Will, who has never had to work thanks to the royalties from his father’s Christmas song hit entitled “Santa’s Super Sleigh”, has a lot of spare time. Most of this he spends smoking, watching TV, listening to albums and looking for female temporary companionship. Language: In general the language is contemporary with a special focus on the hipness of the nineties. Many references to music and popular culture – of which Marcus, Will and the few other prominent characters seem to have wildly divergent tastes – propose a sense of involvement or non involvement in the current world. Setting: London suburbs. Will has lived here all his life. Marcus is new to the big city and having difficulty adjusting from a slower Cambridge rhythm. Like with the pop culture references, London is used to fill in certain blanks in Will or Marcus’ understanding of life and living among other people. Character: It seems, at first, that the story is progressing to describe two characters who will eventually become one, particularly because Marcus is a boy and Will acts like one. Because of their individual circumstances, neither has any real responsibilities nor has a mentor to model mature behavior. Marcus and Will move through the world as a twelve year old and a man who has not matured far beyond adolescence. As it turns out, each one develops beyond his initial capacity due to the other’s diligence and commitment. Structure (Rhythm, Tension): The regular back and forth POV shift between chapters adds an ongoing sense of expectation. The chapters are short and dominated by action over contemplation. As a reader it is interesting to realize that even while receiving Will’s perspective in an even-numbered chapter, the next odd-numbered chapter will counter or redefine Will’s situation from Marcus’ perspective – both of which rarely run on the same track. Intention: While the story is not exactly a feel-good tale, there are comfortable elements of cause and effect that remind the reader that every one who crosses through our lives makes an effect. We can’t survive alone. Thematic Preamble: None. The story begins without preamble directly engaging the reader in Marcus’ difficult home situation and Will’s unremarkable life choices. Foreshadowing, Plot & Expectations beyond page ten: My expectation from reading the first ten pages included wondering how these two males would eventually be thrown together. Their lives are so different and they seem unlikely to meet. The overriding question is HOW will these two protagonists come together as opposed to why. Random Comments: ABOUT A BOY was made into a successful motion picture starring Hugh Grant in 2002. I have not seen the picture but I couldn’t help hearing Hugh Grant each time Will spoke. It made me wonder. 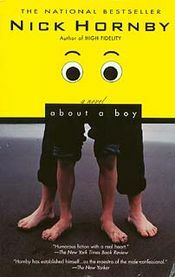 The title is a reference to the song “About a Girl” by Nirvana, a band that is featured in the book, and Patti Smith‘s tribute to Kurt Cobain, “About a Boy“.